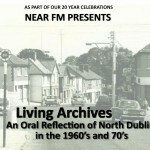 Geraldine Murphy tells us about her childhood growing up near St.Annes park in Raheny. She tells us about the park and regales us with anecdotes about what they did in the area for fun when she was growing up. She also shares with us her mothers experiences of growing up in Whitehall having moved from the city centre in the 1930s.